Belt tensioners ensure the correct tensioning of the V-belt or V-ribbed belt as well as the damping of belt vibrations resulting from changes in load of the motor or the auxiliary units. 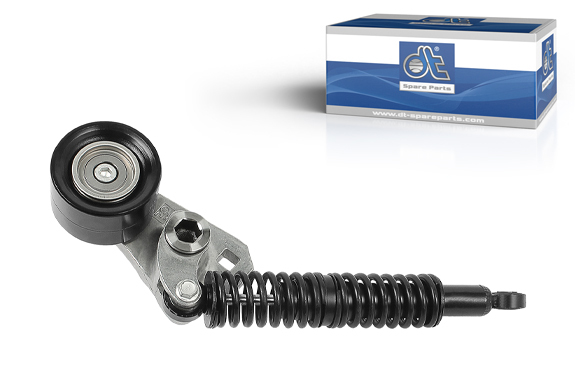 This hydraulically damped belt tensioner is a high performance product and is suitable for applications with precise tension and critical dynamic behaviour. The optimum damping of the belt vibration is ensured by a compression spring made of high-quality spring steel. The sintered metal bush with Teflon coating ensures easy sliding of the belt tensioner. The sustainable quality of DT Spare Parts belt tensioners is regularly checked in a 500-hour service life test. The belt tensioner is built into the vehicle in a slightly concealed position, so space should first be created in this working area. It is important to assess what the longitudinal grooved belt of the dismantled item looks like. If the marks on the roller are offset from the centre, the belt does not align. All adjacent components as well as the bearing clearance of the air conditioning compressor and idler pulley must be checked when the belts are disassembled. A leaking hydraulic cylinder can be a sign of an excessively short belt or one-sided load. The mounting surface should be cleaned before installing the belt tensioner. It is important to mount the mounting screws with the torque specified by the manufacturer to avoid clamps or tensions. The longitudinal grooved belt should always be replaced. Now the engine can run at idle speed and a visual check should be carried out to check whether the belt is aligned and the tension corresponds to the manufacturer‘s specifications.